There’s a new Canadian superhero and he’s here to guard the North. Auric of the Great White North is a new superhero comic book, the first issue being exclusive to Northern Ontario Expo’s 2015 show. There’s a new Canadian superhero and he’s here to guard the North. Auric of the Great White North is a new superhero comic book, the first issue being exclusive to Northern Ontario Expo’s 2015 show. The Northern Ontario Expo is a 2 day sci fi and pop culture convention held in Timmins, Ontario April 25 and 26. During the shows previous year, artist Mike Rooth, designed the new mascot for the 2014 show and was named Auric by Katy Montigny during the social media contest held on the Northern Ontario Expo Facebook page. Toronto artist Andrew Thomas approached Artist Alley coordinator and comic writer Davis Dewsbury about creating an exclusive comic featuring Northern Ontario Expo’s mascot. Thomas and Dewsbury have been hard at work creating the family friendly comic book, set to be released on April 25 at the 2015 Northern Ontario Expo. Set in a fantasized Timmins, the first issue will showcase Auric battling monsters and saving the day. After Northern Ontario Expo, Thomas and Dewsbury will be working on another mini comic featuring Auric for Niagara Falls Comic Con in June and then possibly a full series afterwards. 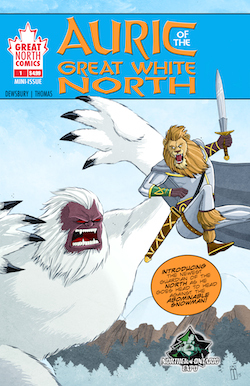 Auric of the Great White North’s first issue will be available for purchase this April 25 and 26, exclusively at Northern Ontario Expo. Both Thomas and Dewsbury will be available at the convention to talk about Auric and their current projects.